Here you have my list of the best 3 season sleeping bags that are on the market in 2019 season, all top brands and truly reliable items. Synthetic sleeping bags. These are generally heavier but they keep you insulated even in wet conditions. Down fill sleeping bags. As a rule, all such bags come with a treated down which is supposed to maintain its insulation properties even when/if it becomes wet. Regarding the weight, this is dependent on the insulation (mainly), the shell fabric, the design, and features. Here you have some really ultra-lightweight examples that are suitable even for backpackers. But some are typical camping tools, bulky and heavy, built for comfort. Regarding the gender, you have some models that are built for women and some are for men, but some of them are unisex sleeping bags. Most of them are built in different sizes so you can choose and avoid carrying unnecessary weight. There are completely new models here that are launched in 2018 and in 2019, and some are modified versions of the models that have already been around for some time. All the bags are only briefly described here, so please follow the links to my full reviews. Big Agnes Bolten SL 20 Degree Sleeping Bag. 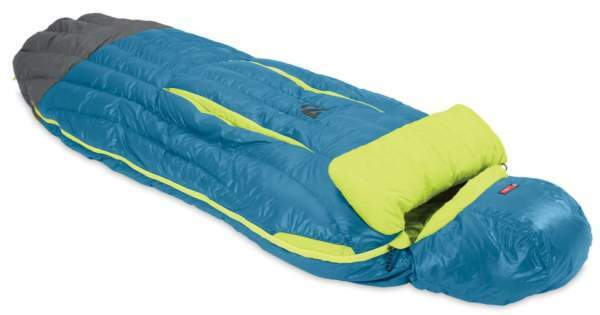 The Bolten 20 is a completely new sleeping bag on the market. It looks like a typical mummy style bag but it has some unique details that add to the comfort. On both sides, the bag has wide sections with stretchy shell fabric so you are far less restricted than in ordinary mummy bags. The letters SL in the name indicate that this is a super light bag, at least from the perspective of a bags with synthetic insulation. Here you have the PrimaLoft Silver and PrimaLoft Gold Active insulation. So the weight is 2 lb 11 oz (1.22 kg) for the size R and 3 lb 1 oz (1.34 kg) for the size L. The temperature rating is 20 F (-7 C) so this is a true 3-season sleeping bag. Please follow the link for more. Big Agnes Hitchens UL 20 Sleeping Bag. 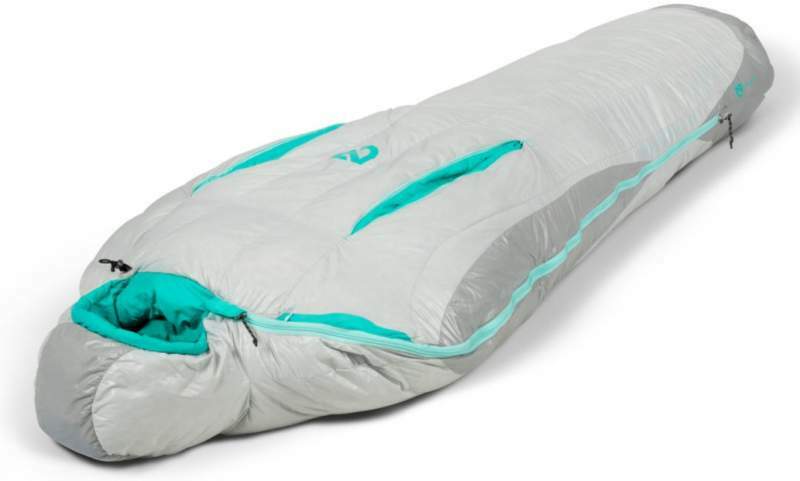 This is a typical mummy-style sleeping bag, but this is an ultra-lightweight item which weighs only 1.69 lb (765 g). This explains the letters UL in the name. They have achieved such a great weight by the quality down 800 fill and by a clever design which also includes a very short side zipper shown in the picture above. The official temperature rating is 20 F (-7 C) so this is a type that can be used for quite low temperatures and it is therefore rather versatile. The packed size is exceptional, only 6 x 7 inches (15 x 18 cm) for the R size. Note that they build it in three sizes. Please read more in the link below. 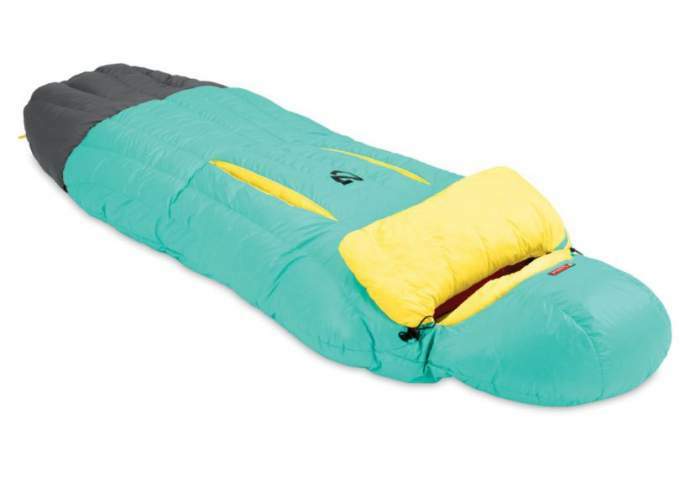 Big Agnes Flume UL 30 Degree Sleeping Bag. The letters UL in the name have the same meaning as in their other bag above, this is an ultralight item, but it is even lighter than the Hitchens bag. The bag weighs only 1 lb 6 oz (624 g) for the size R and it can be compressed to 7 x 5.5 inches (18 x 14 cm) assuming that you but an extra carry bag with compression straps. So this is a bag for ounce-counters and its temperature rating is 30 F (-1 C). In view of this, the bag is suitable for most situations in a 3-season use. The fill is treated 850 down and the construction is what they call the Insotect Flow with a body-mapped baffle technology. Note that this is a high-end technical bag with a price to match. As you realize from the name, this is a women-specific sleeping bag. It comes with some unique features, and one is the two-layer design – you have a built-in blanket. This you can use alone if it is not cold, or you can use both at chili nights. Note that the blanket can be unzipped completely and use for sitting in the camp. The bag is also with an innovative zipper design with feet vent. The temperature rating is 20 F (-7 C), and I have included it in the list here because of its versatility but its temperature rating is such that you might use it in all seasons as well, this is all individual. The weight is such that you would not carry it on the trail, this is a camping tool; it weighs 5 lb 4 oz (2.38 kg) and the fill is synthetic ThermaPro. This is a very affordable bag. Please read more in my full review. 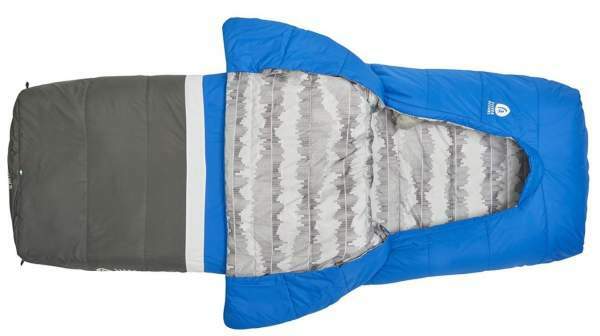 Kelty Tuck 20 Degree ThermaPro Ultra Sleeping Bag. This bag has been on the market for a number of years, but here you have its 2018 version. So there is more insulation in the foot box, the baffles are different now, the hood is different, and they have also changed the color. The bag has a unique zipper design which allows you to open it only on the bottom and to walk in it. The insulation is synthetic ThermaPro and with the offset quilt construction to avoid cold spots. A very durable fabric is used so you have the shell which is 75D polyester taffeta. They build it in two sizes, and as you would expect it is not lightweight, you have 3 lb 11 oz (1.67 kg) for the R size. So this is a camping bag and it comes with a great price tag. The temperature rating is 20 F (-7 C) so this is a 3-season tool as declared by the manufacturer. Please read more in the link. Marmot Women’s Teton Sleeping Bag. This is the 2018 version of the popular Marmot’s sleeping bag designed specifically for women. It is built in two sizes, R and L, and the fill is treated down. The official temperature rating is 15 F (-9 C) and it is also EN tested. The temperature rating is such that this is a true 3-season bag. Note that you have an extra zipper on the side, so you can cool a bit and get some draft if you use it in a warmer environment. The main zipper can be unzipped from the bottom as well, so again and you can get your feet out if you feel too warm. The bag is in the group of lightweight sleeping bags, the R size weighs 2 lb 15.5 oz (1.32 kg). The packed size is 18 x 8.5 inches (46 x 22 cm). The style is a bit relaxed mummy type which means that it offers more space above the knee zone, this is useful because you can bend your legs if you sleep on the side. 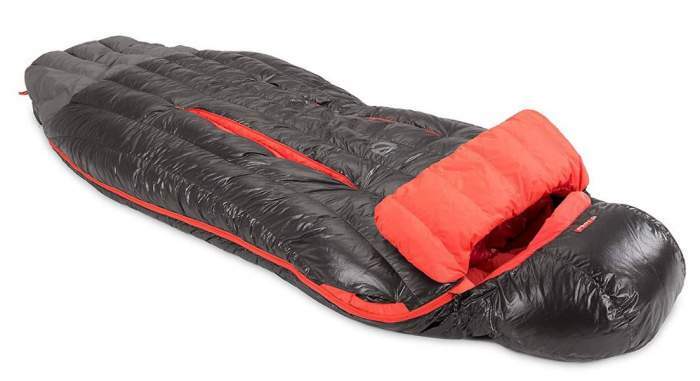 Mountain Hardwear Ratio 32 sleeping bag. This bag is designed for temperatures as low as 32 F (0 C), so this is a rather typical 3-season tool. The insulation here is the Q.Shield treated down 650 so the bag will preserve its insulation properties even if it becomes wet. With the weight of 1 lb 13 oz (829 g) for the size R (and they build it in two sizes), this is definitely a lightweight bag suitable even for backpackers. The cut is what you might describe as a comfort mummy style and you have what they call the Thermo Trap baffle system with baffles positioned like bricks as you realize from the picture. NEMO Disco 15 Sleeping Bag. This is a really innovative design, they build it in what they call the spoon shape. So this is an enlarged version of a mummy bag which gives lots of knee space in the bag. But it has several more features and those include the ThermoGills and Blanket Fold. The former implies zippered openings on the chest which you see in the picture. The Blanket Fold is the piece which comes under the chin to prevents drafts, it is also visible in the picture above. Note that it also has an integrated pillow pocket. The insulation is Down 650 fill. Now, the weight is 2 lb 11 oz (1.22 kg), so this is a camping tool, or for any activity where you would not carry it. The temperature rating is 15 F (-9 C). Please follow the links to read my full review. The Ramsey 30 is a mummy-version of the Disco bag shown above. The shape is standard mummy type but you still have some of the new features seen in the Disco bag. So you have the Thermo Gills, the Blanket fold, and a waterproof foot box. The insulation is 650 Nikwax Hydrophobic down. The shell is a lightweight 30D nylon ripstop with a DWR finish and the foot section is waterproof 40D nylon ripstop. The weight is 2 lb 1 oz (0.935 g), so this is a versatile tool suitable also for backpackers and hikers. The temperature rating is 30 F (-1 C). But note that they also have a 15-degree version with very similar features. Nemo Women’s Rave 30-Degree Insulated Down Sleeping Bag. This Rave 30 sleeping bag is a women-specific design which implies certain size and insulation distribution. They build it in two women sizes R and L. It comes with several award-winning features of this brand. So you have Thermo Gills, the bag is a hybrid between a rectangular and mummy style bag, it has Nemo’s Blanket Fold, and a waterproof & breathable footbox. But this is not all. You also have a pillow sleeve inside the hood, plus a zippered pocket for valuables. The bag is with a two-way zipper so you can unzip it from the feet only to have ventilation if you feel warm. The fill is 100% Responsible Down Standard (RDS) Certified down 650. If you want some numbers to see, note that the weight is 2.5 lb (1.13 kg) and the packed size is 18 x 9 inches (46 x 23 cm). In this Riff 15 sleeping bag you have a patented design and two award-winning features i) the Spon shape, and ii) Thermo Gills. The former implies that you have much more space at elbows and knees areas so it is perfect for side sleepers. The latter implies that you have an extra design for light ventilation when needed. You also have a Blanket Fold for extra cushioning and to prevent cold drafts, a zippered pocket in the shoulder zone, a waterproof footbox, a pillow pocket in the hood. What makes it different from some other NEMO models here in the list is such a combination of features plus the 800-fill. The weight is 2 lb 9 oz (1.16 kg) so it is only moderately lightweight and still suitable for backpackers and hikers, and its temperature rating is 15 F (- 9 C) so this is a true 3-season sleeping bag. Nemo Aya 15 sleeping bag for women. This Aya sleeping bag is a part of Nemo’s new series that also includes Kayu sleeping bag for men, and they also build them in 15 and 30 degree versions. So this is a women-specific design with insulation distributed for a women’s body, and with the appropriate length. They build it as the regular and long versions. The insulation is 800 down treated with Nikwax, so you have the best of the best. The temperature rating is 15 F (-9 C), and the bag is also EN rated. This is a bag for 3-season-plus, so if you feel warm in some situations you have Thermo Gills on the chest area, you can see them in the picture above. Those are zippered cuts through the insulation, but they are sewn-in on the inner side, and they give a slow ventilation as compared to the case when you open the side zipper. This is an ultralight bag suitable for backpackers, it weighs 2 lb 1 oz (940 g) in the R size. The packed size is (L x D) 16 x 9 inches (40 x 23 cm). Nemo Women’s Cleo 15-Degree Down Mummy Sleeping Bag. This Nemo Cleo sleeping bag is a women-specific design which they build in two sizes R and L. By the shape this is a typical mummy-style bag but it comes with several features unique for this brand. So this is a patent pending design with a 650 down fill and it includes thermo gills (dual zippers on the chest zone), a blanket fold (which is a small down-fill blanket underneath the chin, see the picture), and a waterproof footbox and hood. Note that the bag comes with a compression stuff sack so you can pack it down to (L x D) 12 x 7.5 inches (30 x 19 cm). 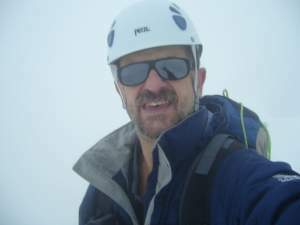 The weight is 2 lb 12 oz (1.26 kg) so it is moderately lightweight, but its temperature rating is very good 15 F (-9 C). Please follow the link to read more. The Sierra Designs Cloud 800 is a 35-degree (1.7 C) sleeping bag, and this is an innovative ultra-lightweight zipperless design. It is declared as a 3-season tool with all good reasons. It is built in two sizes, and the weight for the R size is 1 lb 7 oz (0.66 kg). So you will not find many bags that can match this temperature/weight ratio. So the bag is very versatile, suitable for backpackers and for any other outdoor use. The shape is similar to a mummy-bag but the absence of zippers implies that you have a blanket which is larger than the bag, so you can wrap it around you. It also has feet vent. The fill is a treated down 800. Note also that you have a sleeve for the pad, and the bottom insulation is reduced because it is assumed that you will use a pad, so the weight should not be a surprise. Sierra Designs Frontcountry Bed 35. Here again, you have a zipperless design of a particular type. They call it ‘frontcountry’ here but it is essentially the same concept they used in their backcountry bags that have been around for years already. This frontcountry model is a new 2018 sleeping bag. Note that they also have a Duo Version of this sleeping bag which may be used as a solo bag if you go for car camping and feel clautrophopic in ordinary bags. The features of this tool are as follows. This is a very affordable bag with synthetic insulation and the temperature rating is 35 F (2 C). It comes with an integrated pad sleeve and you also have a feet vent for extra comfort. As mentioned, the design is without zippers and you have an oversized comforter instead. The weight is 4.37 lb (1.99 kg) and the packed size is 20 x 11 inches (50.8 x 27.9 cm), so this is not something to carry in the pack. This bag is built for comfort so this is a pure camping item. Please follow the link for more. So this was my list of the best 3-season sleeping bags that are currently on the market. It will be updated regularly so please bookmark this page and visit it from time to time. Those are all single sleeping bags, but if you need bags for two, check here and also visit my page with bags. You will certainly need sleeping pads, so check my list with pads for car camping or visit my page with pads. Hi. Thanks for this great review of sleeping bags. Although I’ve slept in sleeping bags more times than I can count, I did not realize they have come out with sleeping bags that are designed specifically for women. I have not shopped for sleeping bags in a while. Unfortunately, I don’t have time to read all of the in depth reviews that you provided for us. I did read one though. So, I apologize if I am asking about something that you covered some where else. Aside from the more pastel like, girly colors, how are the women’s sleeping bags different from a unisex or a mans sleeping bag? Hi Sondra, great to hear from you. There are several things related to gender issue and bags. One is certainly the length, to avoid carrying unnecessary weight. So you choose a size that is appropriate for a shorter person. With unisex bags you would simply go for S or M.
But there is also a difference in shape, like a narrower shoulder zone and wider hip area in women’s bags. Yet another is a difference in comfort rating for women and men. Women bags also typically have more insulation in the footbox and in some other areas as well. I discussed these things a bit in my text about bags’ temperature rating.